For Hanoian, the morning will be incomplete without a hot and tasty bowl of “pho” – noodle soup whether in a chilly day or a scorching day. This small restaurant specializes in serving the best chicken noodle with both hot noodle soup and mixed noodle. After your hungry belly is already filled up, you can enjoy a cup of hot milk coffee right at this location and observe the peaceful streets turning into bustle streets that is promised to be one of the most memorable moment in Hanoi. If your time permits, a quick visit to the Chau Long Market nearby and combine with a trip around Truc Bach Lake will be a nice option for a full taste of local city life. The Chau Long Market is a traditional wet market with mostly fresh vegetables, fish, meat and certainly, seasonal fruits so you can catch a lot of nice photos of selling and buying activities from both locals and expats. Therefore, you may easily understand why this becomes an usual place for a Cooking Class inside the Old Quarter. Highlights: The mixed chicken noodle is a “must-try” dish of this small and clean restaurant. The name “Quan Cu” reminds each Vietnamese people of the old restaurant with the real Northern flavor. The restaurant only serves a limited choices of the “Bun Thang” (Hot chicken vermicelli noodle with egg and pork), “Pho Ga” and “Xoi Ga” (Chicken rice) for breakfast but many locals determines this is the best Bun Thang in their lives. At the old days, the Bun Thang is cooked after the Tet – New Year Holiday as this soup is made from all of the leftover: from pork cake, boiled chicken, shrimp to vegetables. The light flavor helps relief after a couple of days eating rich protein food. 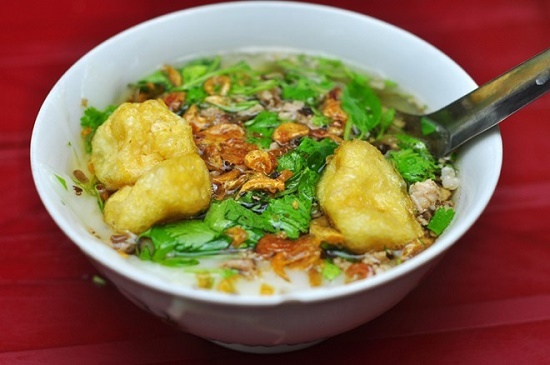 However, this stunning cuisine becomes a precious one for Hanoi food lovers as at first sight, the bowl looks so simple with several ingredients but to prepare for the eye-catching performance, it requires a long process with dozen of ingredients such as herbs, pig bones, mushroom, shrimp paste. 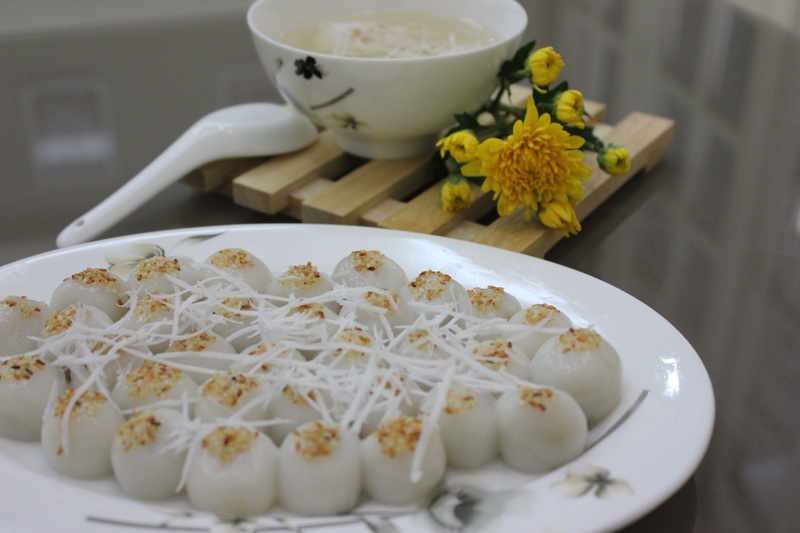 Nowadays, Bun Thang is not only for Tet as people have less time to prepare for such a special food like this. If staying in Hanoi, you should give it a try once in a life time to know the origional taste of Northern Vietnamese noodle. Highlights: As you may find it worrying about a bit shrimp paste put into the Bun Thang bowl. But the secret of this dish stays at the thing that the awful smell will be erased by the hot soup pouring into the bowl. I have heard quite a lot of complaints from my tourists that why they are served “pho bo”, “pho ga” or kind of soup everyday at every place throughout Vietnam. So now enjoying such a dry dish which is sticky rice – “xoi” will be a good replacement to provide your body a huge source of energy. Let’s pass by the Xoi Yen restaurant which is considered to be the 1st Xoi in Hanoi. 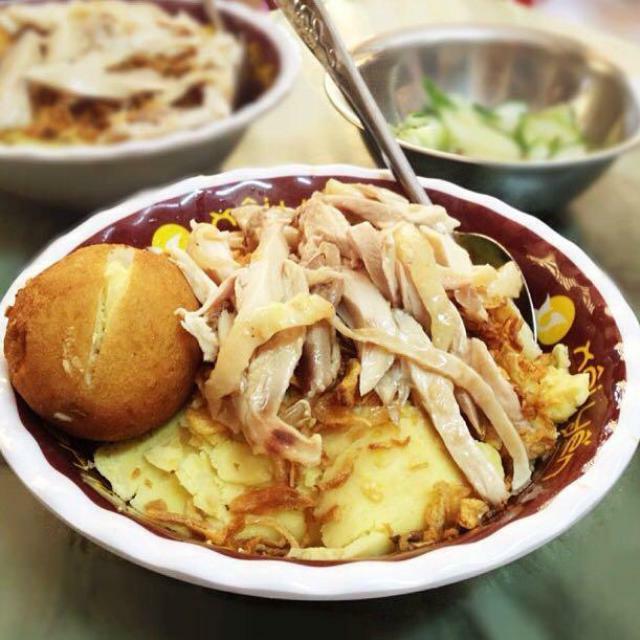 The basic sticky rice served is often Xoi Xeo – ground mung bean sticky rice with fried onions and a plenty of choices for authentic and yummy topping: shredded chicken with mushroom, steamed chicken breast, minced pork, pork cake, fried/braised egg or Chinese sausage and various veggies. Having a glass of soy bean milk is much better to avoid the filling up feeling. Address: 35B Nguyen Huu Huan Str., just a couple of blocks from Sword Lake. Highlights: The restaurant has an English menu with fast service and a nice balcony sitting area on the 2nd If you are vegetarian, this place also satisfies your needs. However, the mixed xoi (xoi thap cam with all the the topping above) is more than enough for a man’s belly. Bánh cuốn (literally “rolled cake”) is a dish from northern Vietnam. It looks like a crêpe roll made from a thin, delicate and wide sheet of steamed rice flour filled with ground pork, minced wood ear & mushroom. The complete hot dish is only serve when you order and usually consists of chả lụa (Vietnamese pork sausage) and bean sprouts, with the dipping sauce called “nước chấm” and inevitably some special fresh herbs eating together. While waiting for your food or enjoying the banh cuon, you may have a chance to see the cook to skillfully demonstrate the whole amazing process, from spreading out the raw wet rice flour to wrapping the cooked rice sheet with meatball, mushroom and serves those on the dish without forgetting slices of fried onions on top. You can ask for a steamed egg if need but it may take a several more minutes to wait. Highlights: It is certainly the Banh Cuon: soft as silk, a bit chewy, a bit oily with sweet-sour-spicy-salty dipping sauce. I believe that the list of detailed food for an early morning adventure may be of your expectation to embark on a busy day ahead. Good morning Hanoi and happy traveling! 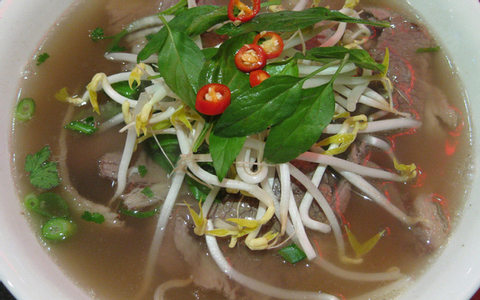 In previous chapters, I have mentioned many tasty dishes made of 2 special noodles, bun and pho. Today, let’s me be your foodie tour guide again for another 8 minutes. I bet this time, you will not regret, for sure. Many of my friends are sweet teeth, so we can gather together and find new places offering wonderful dessert. Here is our best list. 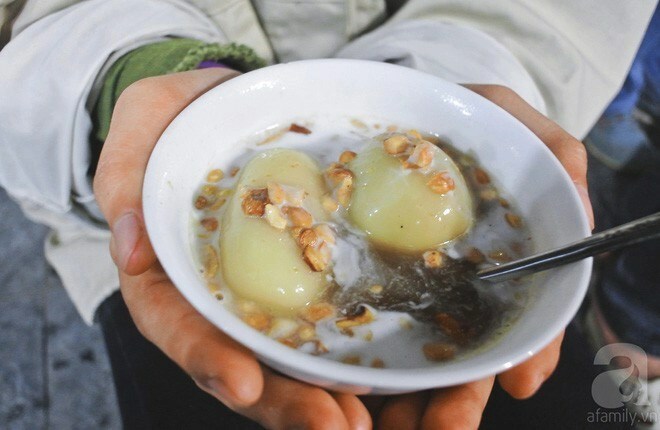 Hanoi has many sweet foods, so it is a big mistake if you have not tried one when visiting this beautiful city. Basically, like many Asian countries, most of Vietnamese sweeties are made of sticky rice or its powder. Han Thuc (Cold Food) festival was few days ago. On that day, people often eat Troi Cake and Chay Cake. 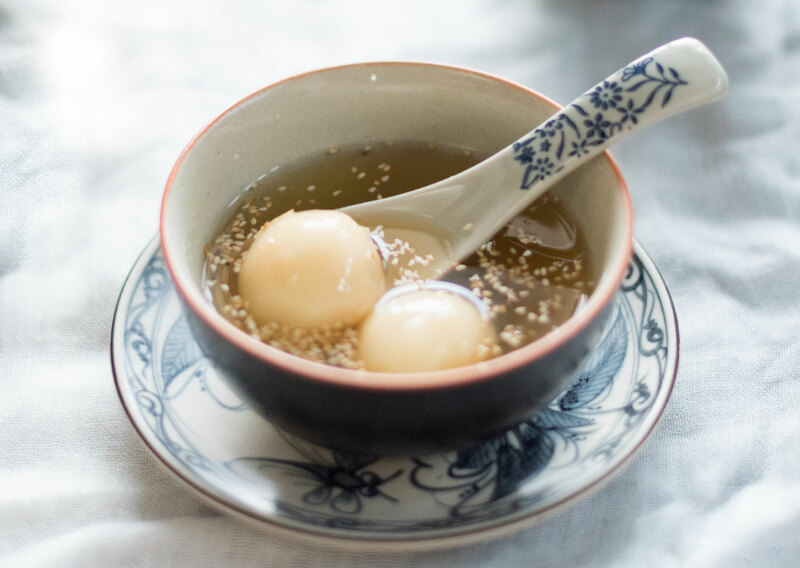 Troi cake is a ball of sticky rice powder with palm sugar inside. Many cute white balls will be boiled and served cold. When they are well cooked, they will be floating on the water so it also has other name which is Floating Cake. Chay Cake is similar to Troi cake, but instead of palm sugar, it is filled with mung bean or green bean paste. Chay Cake also has a second name, Lean Cake. Both of them will be sprinkled with some sesame on the top. They are sooooooo delicious as all the ingredients blend into each other well. The sweetness from sugar, the stickiness of glutinous dough, and the rich, nutty flavor of sesame can make you eat the dish unstoppably. 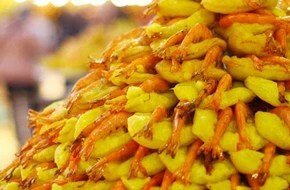 You can find those foods in many street vendors appearing in almost every corner in Hanoi. However, if you want to sit down, there are 2 shops offering those foods in high quality, according to may experience. The first one is right at the corner of Luong Van Can and Hang Bo Street. It is small but always crowded. The price range is from 15000 VND to 30000 VND per dish. I think you might not be able to eat over 30000 VND as this shop’s products are quite too sweet for some people. My friends love it but I think they have too much of sugar. The second one is located near Ham Long Church. It takes quite a bit of time to walk from the centre to there, but if you have scooter, your iron horse will bring you there in just 10 minutes. The price in this shop is similar to the one on Luong Van Can Street. Hanoian loves food, generation after generation, so it is easy to understand why there are always new sweeties in this ancient city. The thing I like most is Sua Chua Nep Cam (Yoghurt with Black Sticky Rice). It is sweet but not too sweet; it also has a light flavor of yoghurt blending perfectly with Black Sticky Rice. Can you imagine it? It is super good for someone like me, who loves sweetie but hate obesity, love sweetness but hate being sweat when doing work out, like eating wonderful food but want to have a strong heart. 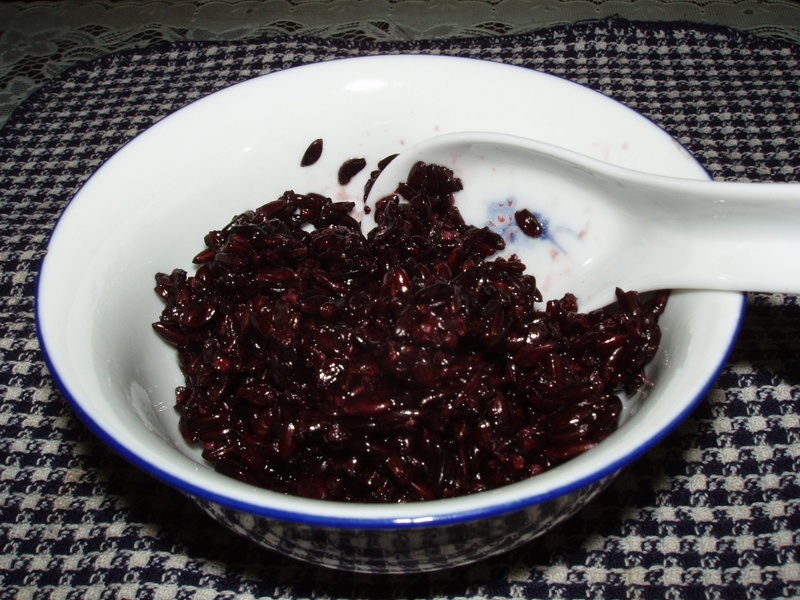 Since this food provides a lot of fiber and many nutrients from dark brown (black) rice and yoghurt, I can happily and peacefully enjoy it without feeling deeply regret later. You can find Sua Chua Nep Cam in mostly café and dessert shops, especially the ones for teenagers. In Giang Café, which is famous for egg coffee also offers this lovely food. 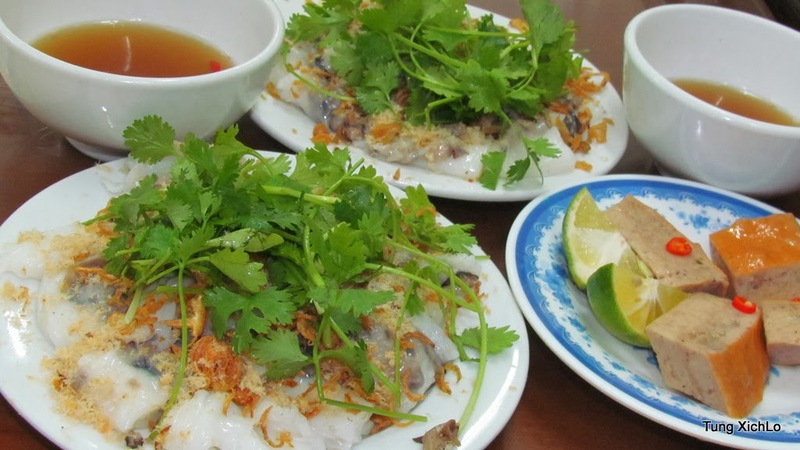 I hope after reading this article, you will have a few ideas about where to eat in Hanoi. I know it is hard to choose as Hanoi has too many wonderful foods to discover, so maybe my friends who run some interesting tours for foodie can help you. You can contact at Indochina tours Vietnam. Last but not least, don’t forget to read the next chapters, I hope you will have a colorful time in Vietnam. See you soon! I guess that after reading the title, many will feel so curious of this new world. 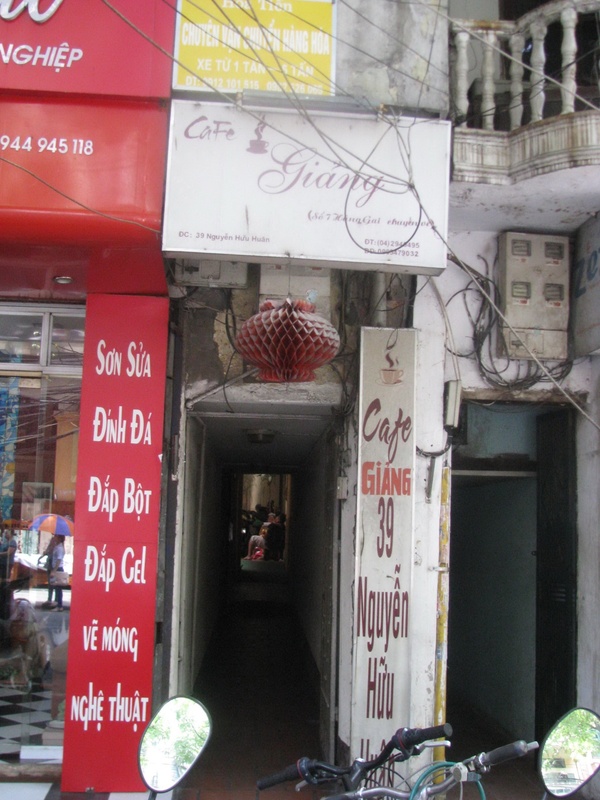 Although this place is so close to the Old Quarter, the belated heart of Hanoi with various choices of food, it has its own features of food that no one will forget after a try.In order to enjoy this special food your, you are free for 3 options: a private car, a motorbike or a bike. These private vehicles let you stop at any places of your interest for photos hunting. There are two times of the day that are highly suggested for you to visit the lake, sunrise and sunset as those are great chances to take stunning photos of the sky and the water. If you start at any other time of the days, you will also find a lot other great moments along this largest lake of Hanoi. Now we may start with the most traditional drink of Vietnam: coffee with milk. It is not surprising that the Bloomberg once reviewed that this specialty will be fit in the top 10 coffee drink in the world. Also, the President Obama on his trip to Vietnam also listed this coffee is a must try beverage in our country. A bit deliciously sweet condensed milk with dark-roasted coffee whether hot or cold may wake you up for a new day ahead, especially when sitting in front of the spacious lake to enjoy the fresh and clean atmosphere. You may easily find any coffee shop around the lake, or simply, just stop next to the Quan Thanh Temple, along the Thanh Nien street to find the most favorite one. After coffee time, we will be ready for our food tour as I promised, do not forget to you’re your stomach before going on. Take a short ride or drive to the Temple of Mother Godness, in Vietnamese it is called Phu Tay Ho, you will be impressed by a street full of food here. People who visit West Lake often stop here for worshiping activities for good luck and smooth work with abundant of money will flow into the pocket. They also do not forget to try the Shrimp Cake (Banh Tom) where seafood lover may never ignore. The dish is listed as an evitable dish in the menu of Hanoi snack food. You may love this special cake with 2 big pink shrimp set on the mini “pan cake” after being deep fried in the boiling oil pan, the cake is served with sweet and sour fish sauce and fresh herbs. At the same street, foodie should not miss the Snail noodle (Bun Oc) or Paddy Crab paste vermicelli (Bun Rieu). The dish is delicious for its featured soup of a bit sweet with pork ribs and a bit sour with tomatoes and vinegar. Tasting the soft noodle and enjoy a colorful bowl of soup in any time of the day may freshen up your body if you have had too much meat the day before. Departing on the trip of Food lover, you should stop at one roadside steamed snails to feel the soul of Hanoi cuisine in winter. The best snails should be medium well cooked and served with secret fish sauce of garlic, ginger, lime juice, sugar, vinegar, chopped lemongrass and chili. That is the dipping sauce which make the dish delicious or not. If you are served the bold taste with plenty of flavors: salty, sweet, sour and spicy, and also clean and fat snails boiled, you have the best steamed snail ever. As usual, I often drink just a sip of this sauce to add on the strong flavor of snail eating. There are several nice roadside snails shop along the Trich Sai street that you may find it easier to drop by. I hope this short list of cuisine may somehow satisfy your stomach on the trip to West Lake, and agree with me that, there is the other food paradise outside the Old Quarter.